The Winter Bites menu for the Lindenhof European Restaurant was all the temptation I needed to check out their new location at 268 Preston Street near Gladstone. Well, new to me. They have been there for almost 2.5 years now but my last visit to the Lindenhof was back in the day when they were located near Richmond and Carling. We received great service and thoughtful attention to the pace of our meal. I appreciated that. We were served beautiful multi-grain buns with butter (Lactantia!) but took a pass, knowing many calories lay ahead. Beer is the right beverage for this menu. I picked their 17 oz Lindenhof draught ($6). Not heavy at all. Our first course was the Zweibelkuchen, a baked caramelized onion tart. It came accompanied by a dill sour cream. This dish is normally $7. 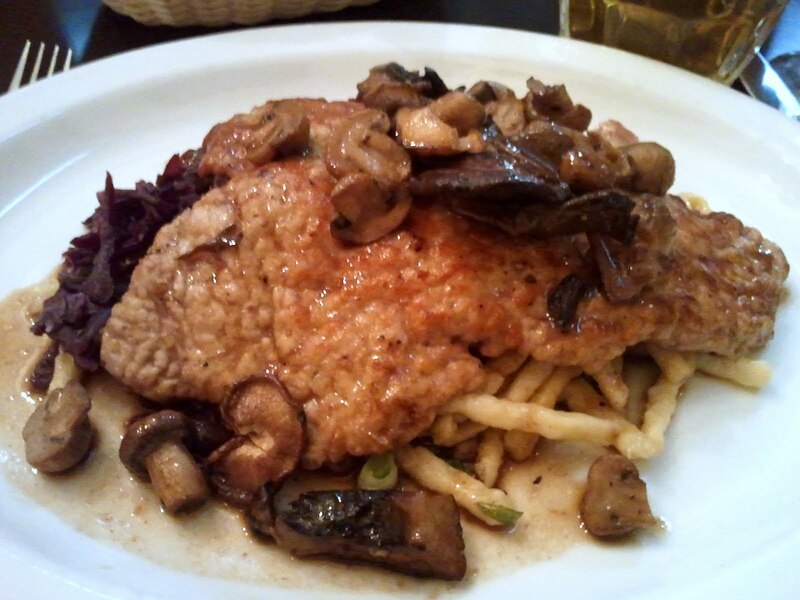 We both picked the Jaeger Schnitzel, pork fried schnitzel with assorted roasted mushrooms in a red wine reduction with spaetzle and braised red cabbage. This dish is normally $18. 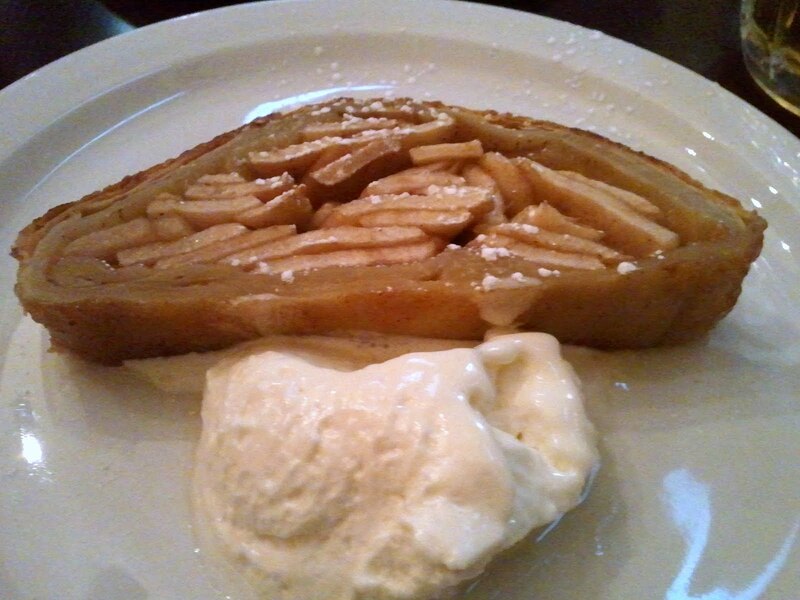 The dessert was Hall's Apple Strudel with Bourbon Whipped Cream. This dish is normally $6. The Jaeger Schnitzel stole the show. There was a distinct smoky flavour throughout the dish that complemented the spaetzle and the pork. I love braised red cabbage and wished there was more but there was no plate real estate left to allow for that. The onion tart was tasty enough and the dill sour cream was a refreshing partner. I can only guess how rich it was and may take a pass next time. A strudel is a predictable dessert in a German restaurant. Not a problem though. I dug out the cinnamony apple and then went for the strudel. The top was flaky but the bottom too dense. Our Winter Bites menu of choice was priced at $30, which works out to a dollar off on the 3-course prix fixe combination. A bit of math I figured out later. I don't often order an appetizer and dessert with dinner and in hindsight, I think I would have just ordered the Schnitzel, as it was very filling. I pushed hard but still didn't finish. In fact, next time I would just order off the menu. If you are coming to the Lindenhof before January 28th to try their Winter Bites menus, go with a big appetite. You will enjoy the food experience but you are going home full. More than full. Check the Winter Bites website for details on the 29 participating restaurants. I should never read your posts just before lunch! 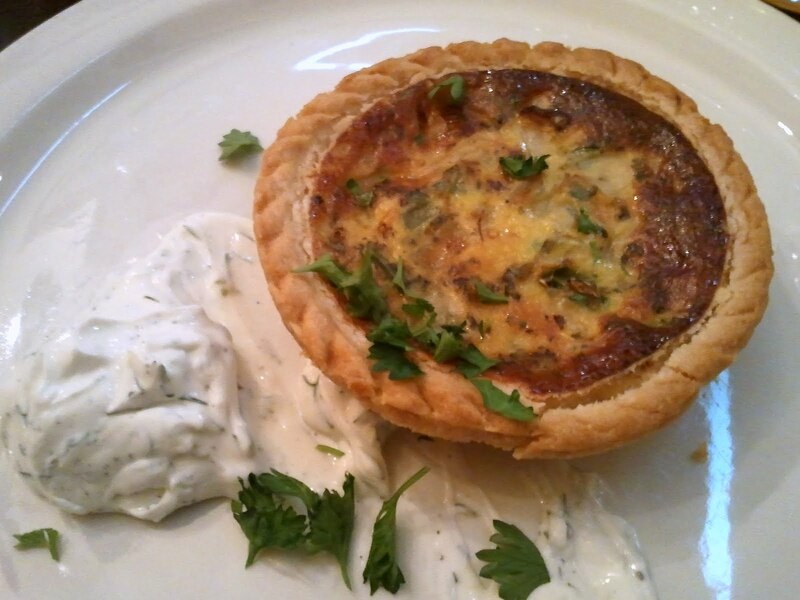 Now, to get the baked caramelized onion tart from my screen to plate. EtiquetteOttawa: Maybe you are due for a leisurely drive into town?